If you spend much time sending lengthy SMS text messaging on your Windows Mobile device but still doesn’t have a good solution to speed up the typing, you may want to give this software utility a try. Named as EASY SMS, it enhances the typing experience by providing a new GUI that allows users to operate and type SMS with single hand. Some of the great features include a customizable font and size depending on own preference. For instance, users can increase the font size for easy viewing with a variety of font selections such as Courier New, Tahoma and etc. Besides, its one touch texting capability has reduced the hassle of the need to have both hands while typing the messaging with stylus. That is not all, there is a simple way to do fast reply by selecting standard reply text and users are allowed to set their own text with common reply text without the need to type all over again. 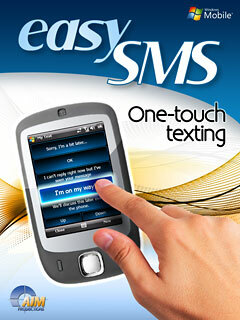 EASY SMS is currently in beta version and is available to public for free download here. Consumed at only 572kB, it is suitable to be installed in any space constraint mobile devices for more effective text communication with your peers.